Yeah, the garden is finally all planted. I put the last of the seedlings – watermelon and cantaloupe -in yesterday and today we are having a nice soaking rain. It is so satisfying to see all the little seeds sprouting up into tiny rows. While the boys were putting up the greenhouse, I planted the existing garden area. We had a very dry spring and the soil was dry. Since nothing was going to sprout without either a good rain or a good watering, I decided to mulch first, then plant. It worked well to put down the mulch, then make my row and plant. However, a good wind later blew things around a bit. 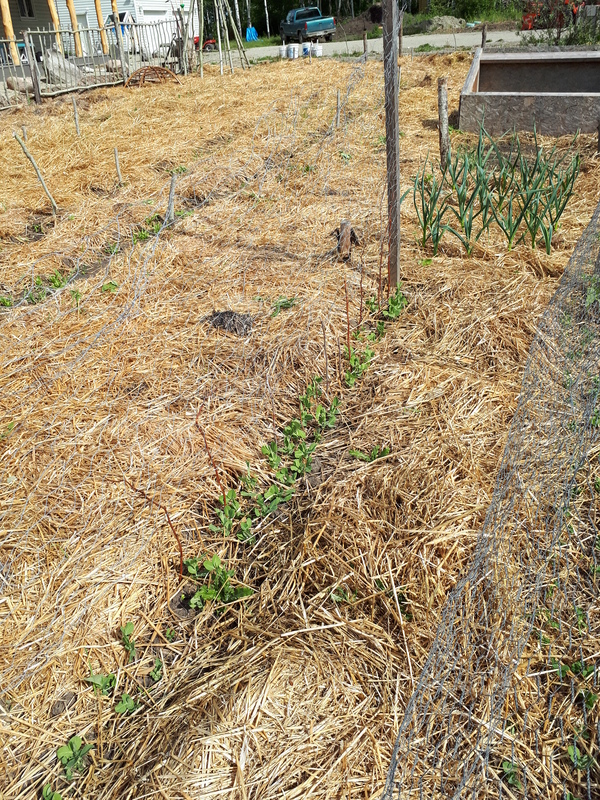 So until the rows got established, I had to go out and make sure my rows were not covered in mulch. But it did allow me to plant, then water right away. Since my watering system is pretty powerful, I wanted the mulch down to prevent erosion. 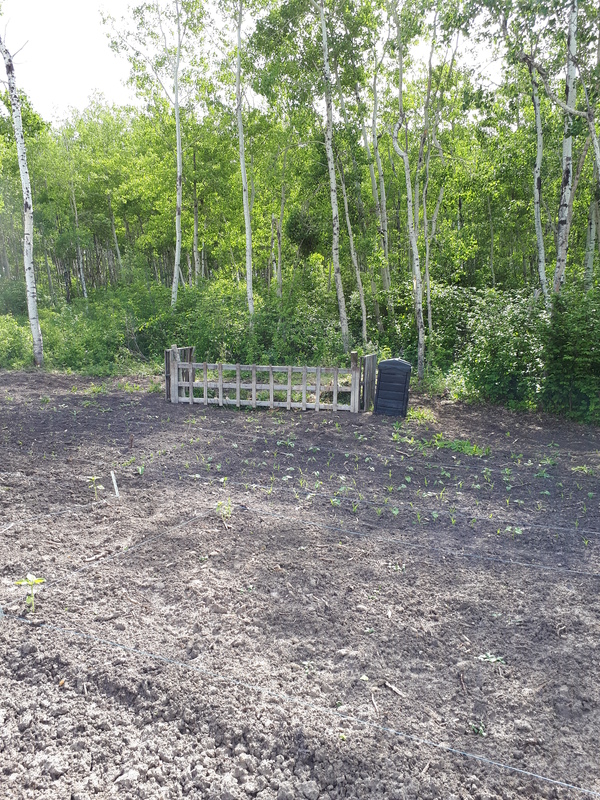 I planted the existing garden area with peas, carrots, beets, all kind of greens, green and yellow beans and some brassicas under the cages Ken made last year. They turned out to be rather hard to store, but luckily we had room and the netting only needed a bit of patching up for this year. Last year, I experimented with permanent mulched pathways. Last fall, Ken tilled up the beds but left the rows. While it did help to have the paths still have the mulch from last year, they still needed to be remulched. 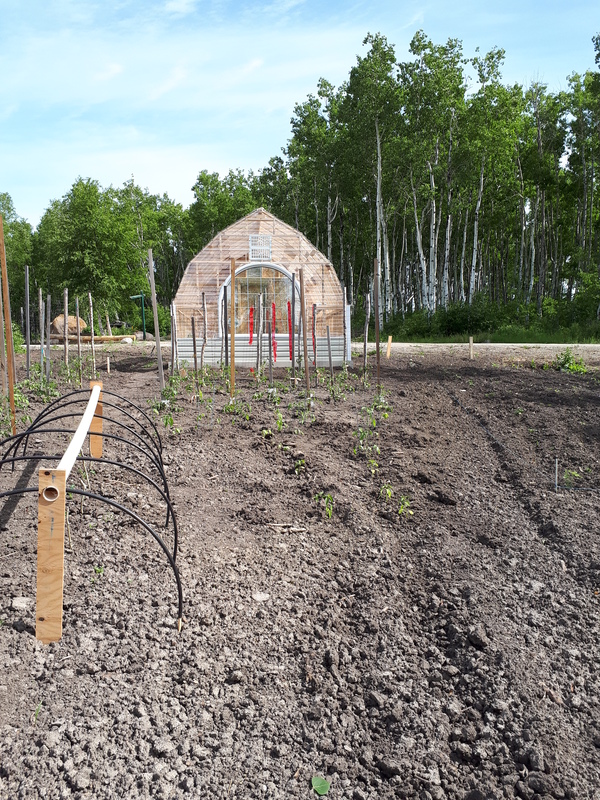 I don’t think I will be sticking with the established rows next year, and will likely till the entire garden under this fall and re-establish new rows next year. I guess I am still not ready for permanence. I like to change things up. 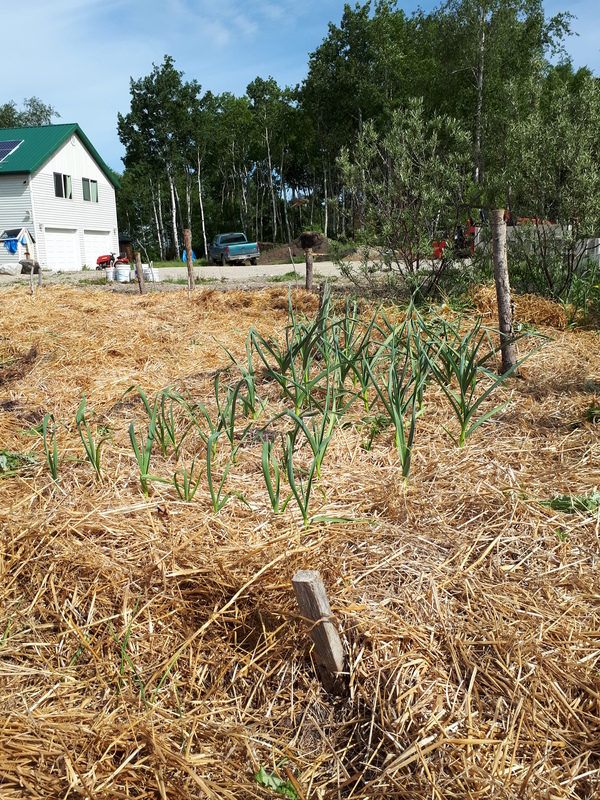 Last fall, I planted my garlic and mulched it well. This spring it has sprouted up. I did have to clear off the mulch for some of it but for the most part it grew nicely through the mulch. I am looking forward to seeing what kind of garlic harvest I get as I have never been able to grow great garlic. Last year we started the garden expansion, taking down some trees, clearing out roots and planting forage radishes in the late summer. This spring we tilled the area and the soil is actually quite good. Still a little heavy, but a couple years of mulch should improve it greatly. Part of the expansion is taken up with the new greenhouse. 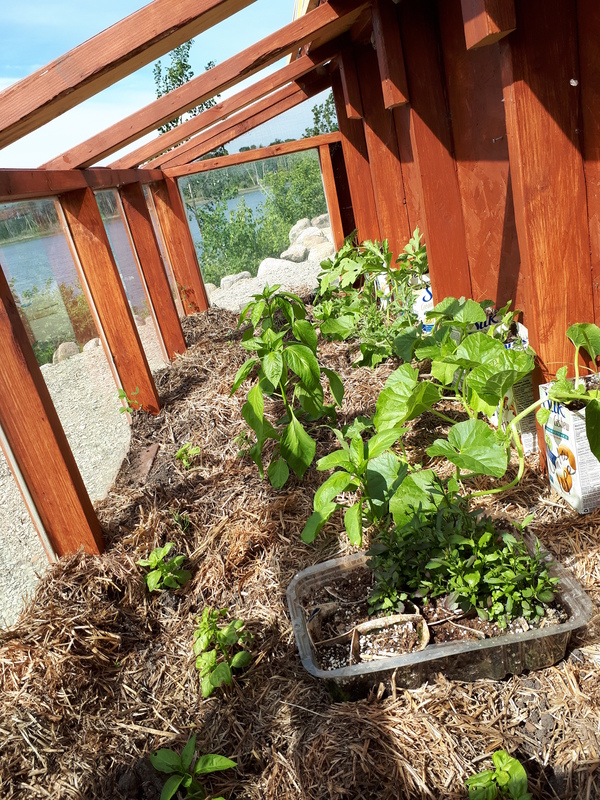 Once the greenhouse was up, I planted the remaining area with tomatoes, peppers, brassicas, potatoes, corn, beans (black beans and chickpeas), cucumbers and onions. I planted this area and am waiting to mulch it once the plants are well established. Last year I planted green and yellow beans around the perimeter of my corn area. This worked well, as the beans provide nitrogen for the corn and you don’t have to crawl into the corn patch to pick the beans. This year, I am modifying the method by planting the beans that will be harvested for dry beans – black beans and chickpeas – throughout the corn patch. The beans should be ready for harvest just after the corn. Will see if this works out. 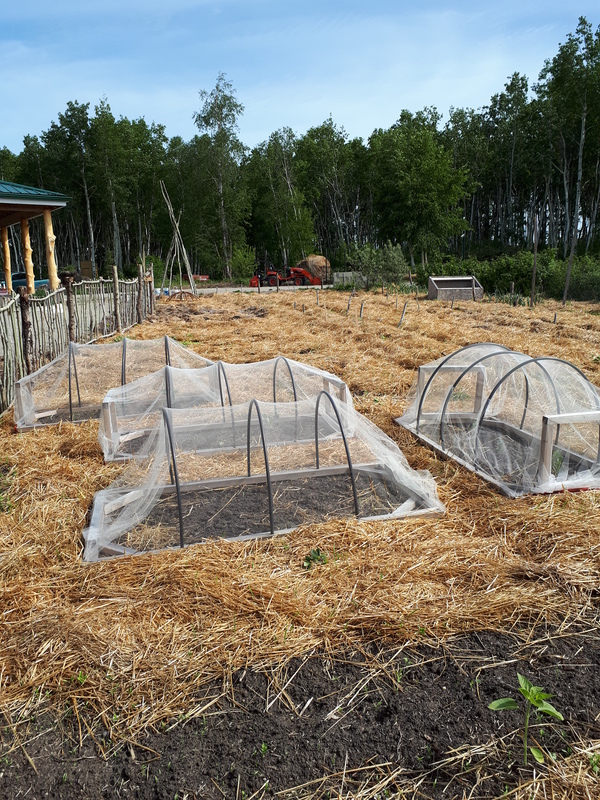 The brassica cages covered with netting worked really well last year at keeping the cabbage butterfly off the cabbage, cauliflower, kale, and broccoli. This year, I am growing a bit more broccoli so we created a new cage that would be easier to store. It is a series of hoops held in place by a center pipe. I planted the seedlings but still have to put up the netting. 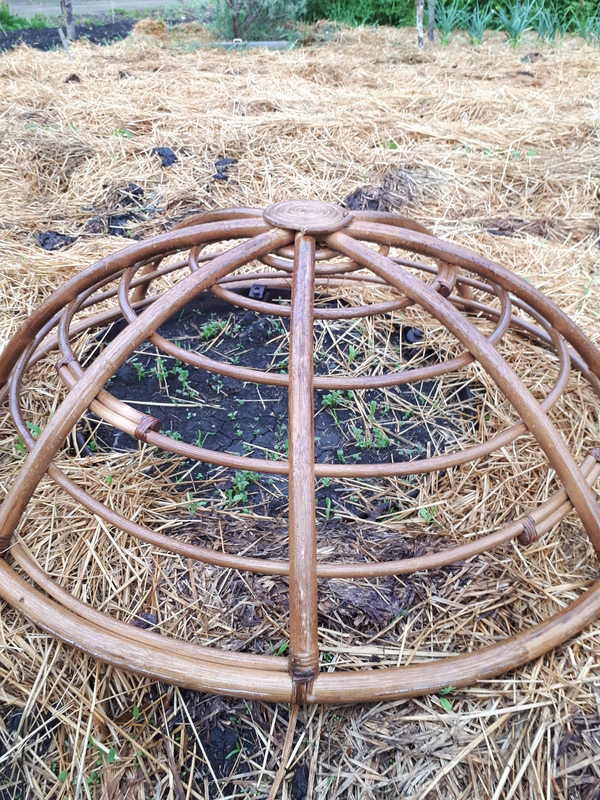 I also planted kale under the form from a basket chair and will cover that with netting as well. The butterflies come out around the beginning of July, so I will need to get that netting up soon. I am also trying a bean teepee. 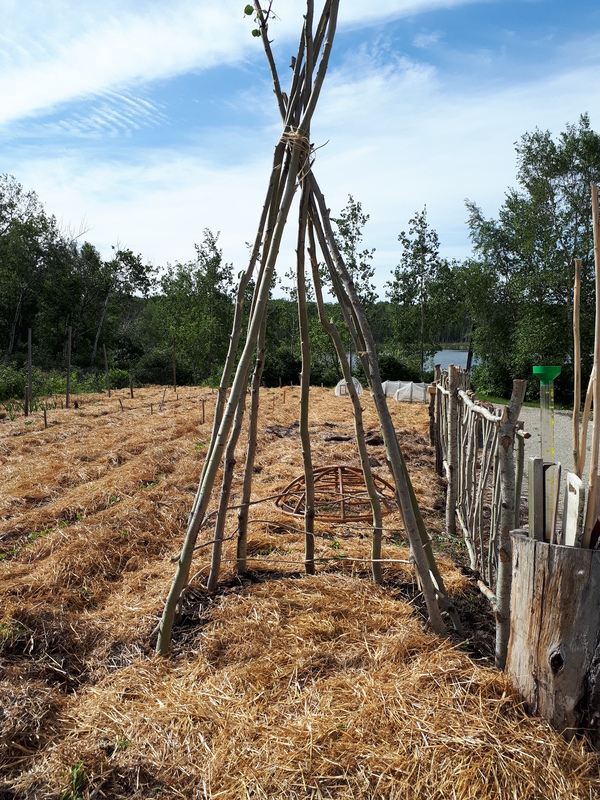 Ken and Lucas helped me construct a teepee from poplar saplings and I planted pole beans around the base. I am now weaving willows around the base poles to give the plants something to climb up. I take the snippers with me on our daily walks and bring home a few more willow stems each day. I am hoping to get a good crop of green beans as well as a cool place for the grandkids to play in. 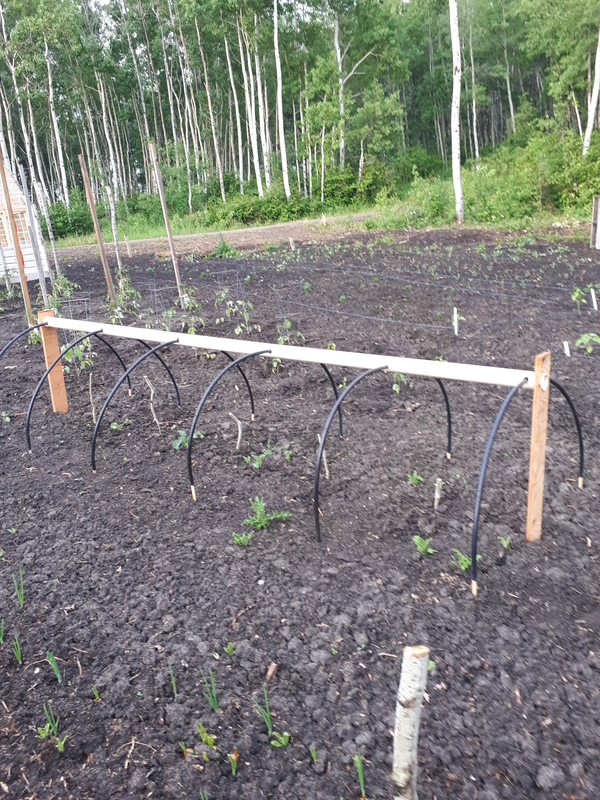 Last year, Ken made me a bunch of tomato stakes with wire attached. They worked really well. As the plants grew I tied them to the wire ‘cage’. They were sturdy enough to hold a fully loaded plant. The plants got plenty of air and sunshine and I had no issues with disease. The stakes were easy to store and are being reused this year. Our little hothouse is back in use again as well. Since the greenhouse was not up until late May, the seedlings were moved from the house (in the sunroom under grow lights) to the hothouse in early May. The plants did really well and were large, leafy and healthy. Once the greenhouse was finished, I asked Ken to move the tomatoes to the greenhouse. 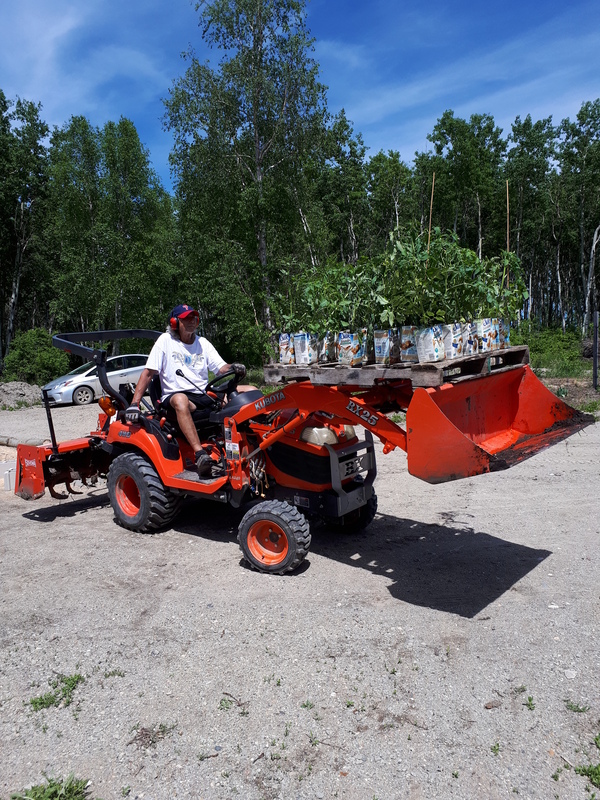 In typical fashion, he figured out how to do it in one load – on a pallet balanced on the tractor bucket! Amazingly they made it without accident. About 18 of them are planted inside the greenhouse and the rest (about 22 more!) are planted in the new garden area. The hothouse is once again planted with peppers and basil. partitions between the spaces to make it easier for the tractor bucket to turn it over. So there will be some spillover in the piles but I don’t think that will matter much. 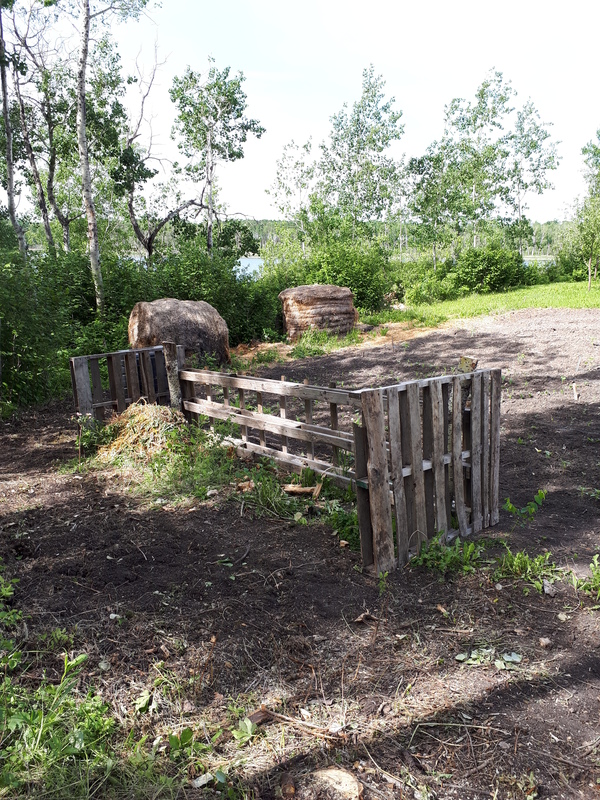 The opening to the compost area is off a path on the side of the garden, so there is room for the tractor to access. And in the winter, it is on our snowshoe path through the woods, so we can drop the compost off on our morning walk. 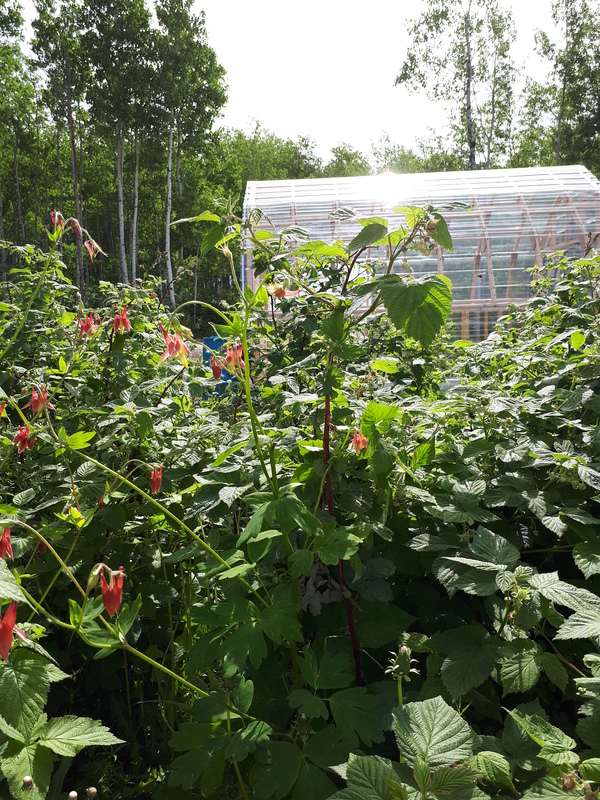 The raspberries are blooming, as is the wild columbine growing in the raspberry patch. The bees are just swarming the area, busy pollinating. Soon we will be picking berries. This entry was posted in Gardening and tagged bean teepee, brassica cages, compost, greenhouse, hothouse. Bookmark the permalink. Looking forward to seeing the grandkids play in the garden and eat all the produce.